Thanks to global efforts in the last two decades, the number of polio cases has fallen by more than 99%. To underscore the importance of immunization, World Immunization Week is observed from 21-28 April this year. As depicted by graduated colours, the coverage of the 3rd dose of polio vaccines in infants was generally higher than 80% in polio-free countries. 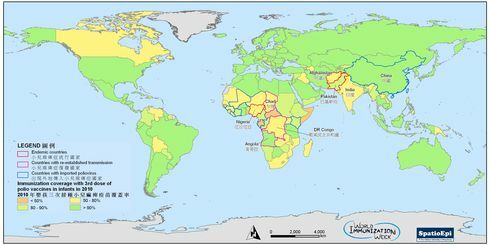 Coloured country borders indicate different levels of poliovirus transmission. After removal of India from the list of polio endemic countries in February 2012, Afghanistan, Nigeria and Pakistan are the three remaining countries with indigenous wild poliovirus transmission. Currently, the geographic area affected by polio is the smallest in history. However, efforts for polio eradication should not slack off as re-established transmission and imported cases have continued to be reported in some countries with low coverage of polio vaccines. Data for the map were obtained from World Health Organization. Poliomyelitis is a highly infectious disease caused by poliovirus, which can invade the central nervous system. Most infected people are asymptomatic, but some shows initial symptoms including fever, fatigue, headache, vomiting, neck stiffness and pain in the limbs. Incubation period usually lasts for 7 to 14 days. Most patients recover from the infection but some may develop irreversible paralysis, permanent disability and death. How does it spread? 如何傳播? Poliovirus is spread from person-to-person, mainly through faecal-oral route. The virus enters human body through the mouth and multiplies in the intestine. Children under five years old are the most susceptible group. There is no cure for poliomyelitis, but vaccination is effective to prevent the disease. Oral polio vaccine and inactivated polio vaccine are two available polio vaccines in the world. Children should follow the recommended schedule of local childhood immunization programme for vaccination. Parents should take extra precautions in the hygiene practices when caring for polio infected children, whose stool may contain the virus.